Circle Culture is pleased to present Apex, a solo exhibition by San Francisco-based painter Kevin Earl Taylor. The exhibition features painting, work on paper and site-specific installation. This is the artist‘s third solo exhibition with Circle Culture. On the occasion of the exhibition opening, writer Carl von Siemens will be presenting his book Der Tempel der magischen Tiere (published by Piper) in conversation with curator Johann Haehling von Lanzenauer. Kevin Earl Taylor paints moments of encounter, often pairing animals and occasionally people in contemplative moments. The subjects face off with an air of mystery as they seem to be sorting out their place in the natural world and relationships to each other. These vignettes are subtle, yet suggest commentaries on our disappearing planet. They prompt the viewer’s curiosity and, at the deepest level, evoke consideration of what it is to be conscious, to be human. In one of the canvases a bubble floats above a group of chimpanzees in various states. Some are looking down in resignation or mediation, while the others seem to look outward but not necessarily at each other. In the orb swims a beautiful fish, hovering over the barren landscape. Yet the chimps barely appear to notice it. One can’t help but ponder -- does the painting speak to diminishing water resources, does it aim to juxtapoz animals from different habitats, or is it about our own alienation from the wonders that surround us, both in nature and in human interactions? 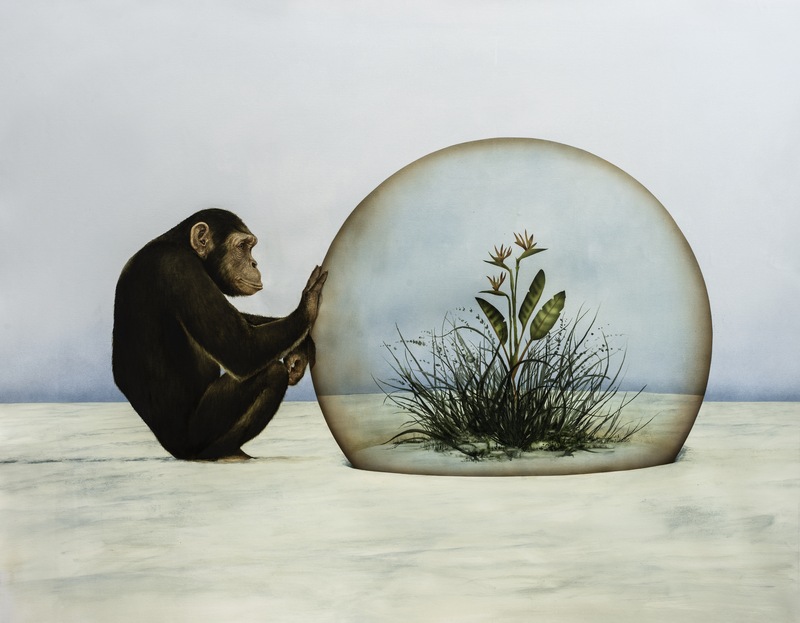 A bubble also appears in a painting in which a chimpanzee presses his or her hands against the surface, peering at a blooming plant. The physical connection between the two, and sense of longing and even loss, are palpable. Is this a commentary on the future of our planet, when liveable space has receded to a small pocket of physical space? Is anything outside of the protective capsule capable of survival? The chimpanzee touches the orb remembering a time when plants were plentiful. Yet the plant behind glass is untouchable, relegated to a special realm as a last remaining survivor of its kind. These paintings of surreal landscapes and encounters pose questions and invite us to respond. Why do we associate the way we do? Is aggression presumed even among adversaries in the animal kingdom? What assumptions are we comfortable making about other beings? Should we reevaluate them in order not to lose something precious? Even amidst silence, can we communicate deep meanings? Why do we sometimes turn away when what we really want is to move towards another? Taylor’s work doesn’t prescribe answers, but rather inspires the viewer to engage with the essential questions of what it is to be human. Taylor’s work reminds us to embrace the questions. It is elegant, clean, and sparse in execution. There is a calmness that attends to these paintings. The imagery and open space invite the rest of us to fill in blanks. Humans are mammals who have developed complex verbal means of communication, yet their absence from these painting narratives compel the viewer to imagine themselves in the compositions, stripped of human characteristics. It’s natural to want to relate to a subject matter in some way, and typically we look for what we most resemble. Thus, we are left to imagine ourselves as non-human mammals. In some cases Taylor places geometric signage into the paintings, or objects to be gazed upon, thereby igniting mystery and signally that the possible narratives needn’t be literal. In one series, he uses the pedestal, common in museums, as a platform to elevate the viewing. Isn’t that what we always do, even in less formal settings? Animals too have ways of sensing one another and parsing out danger and/or friendship. In the painting “Protomartyr” a wolf approaches what appears to be a sleek sculpture of a panther on a leopard skin pedestal. The panther is presented as something rare, extinct even, worthy of this exalted viewing. The painting is about the inevitability that all species are headed toward extinction. Will the wolf be next in line? Even in the turning of its head in dramatic fashion, this immobile sculpture conveys its scorn. Can we even call a sculpture of a panther a panther anymore when we’ve stripped it of its essence and propped it up like a Hollywood icon? What is the intended commentary here, at what price fame and glory? Is the animal relegated to a memory? Taylor succeeds in creating these non-intuitive moments, which the viewer hastens to make sense of, all the while weighing the contrived setting and face off between real and extinct mammals. In addition to portraits in which some animals turn away while others yearn to connect., sits a painting, “Astral Projection”, of one animal fusing into another, or disengaging from itself as if some part of the animal can levitate and participate in the contemplation of the scene. Certainly all living things are interrelated through the air, the ocean, the soil, and even at a cellular level. None of us is an island, whether we sit on a pedestal or within a bubble or poised on the last remaining ice shelf. An aura of vanishing drifts over all these paintings. They sit on the canvas like precious offerings to all that we should be holding dear and may be on the verge of losing. In their soft lyricism, they cry out, it seems, for our own sakes. Taylor’s work is complete because he anticipates and invites the work the viewer will employ to make sense of not just these paintings, but also the challenges they face on a daily basis. As a grouping, the canvases redeem the value of this vanishing time. Tamsin Smith is a published poet, essayist, and creative strategist. She helps mission-driven organizations tell their stories and is known as the innovator behind pioneering social action campaigns like (RED). Her verse collection Word Cave was published by Risk Press in late 2017. Matt Gonzalez is an attorney in the San Francisco public defender’s office and an artist who exhibits with Dolby Chadwick Gallery in San Francisco. He has written numerous art reviews and catalogue essays about contemporary artists and previously taught Art & Politics at the San Francisco Art Institute.